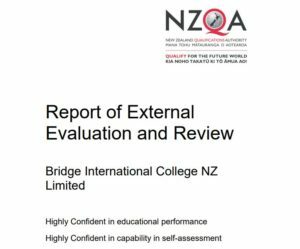 In the recently completed EER (External Evaluation and Review), Bridge International College received excellent feedback and therefore proudly became a NZQA Category 1 school– the highest possible rating. NZQA is highly confident in the educational performance and highly confident in the capability in self-assessment at Bridge. NZQA (New Zealand Qualifications Authority) awarded ‘Excellent’ratings for every evaluation area. In particular, Bridge received a 100 per cent satisfaction rating in the 2016 i-Graduate international survey, compared with 92.6 per cent for New Zealand English language schools and 92.4 per cent globally. The EER process is a comprehensive, evidence-based assessment carried out by NZQA every four years. It addresses achievement, outcomes and key contributing processes to judge the quality of a tertiary education organisation. This is an outstanding result and a reflection of our dedication to providing high-quality education. We look forward to continuing to deliver first-rate learning programmes in the future.